With a little trepidation I left the station - lanes full of taxis ringed the exit. Should I try to get a taxi or should I walk? I had an idea where abouts the hotel was but I couldn't see the landmark that it was near. I know that it was just done from the Kaiser-Wilhelm Gedächtniskirche but it was no-where to be seen. A little hesitantly I thought I'd try the taxi - as the driver came out and opened his boot, I first got him to look at the address. I didn't want another Cologne experience. He looked and then thought, then decided no he wouldn't take me. He told me that it was "geradeaus und links." Luckily I knew what that meant and I didn't really want to argue the point so I walked. I wasn't quite sure how "geradeaus" I had to go before going "links" and when I found the church I wasn't sure which of the two roads to take. I eventually took the road that lead to the tourist information centre - they would be able to give me a map and probably tell me where the hotel was. Well, they sold me a map but did direct me to the hotel - I was almost there, it's actually in the neighbouring complex! I'm was very pleased with the room - it's probably the largest I've had so far. The view from the window was okay as well. 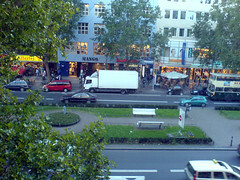 After settling in I decided to check out KaDeWe - so armed with the cameraphone I headed down the road. 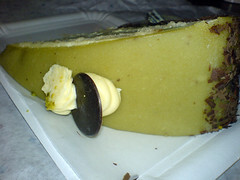 KaDeWe is only 2 blocks away. 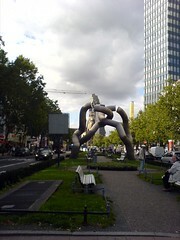 Fans of "The Amazing Race" would recognise this structure - it's just outside the hotel. And this is the rear of KaDeWe - talk about impressive. It rivals Harrods in size - interesting that it's listed as being the largest department store in continental Europe. 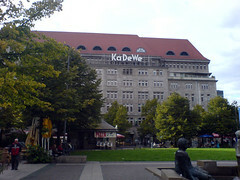 KaDeWe stands for Kaufthaus des Westens and the building was pretty well destroyed in WW2 - although like many things, it was rebuilt, bigger and better. My main interest in coming here was to visit it's food hall - like the Alsterhaus in Hamburg it's not to be found on ground level, but in this case, the 6th floor. It wouldn't be an understatement to say that one could get lost in here - as it's something that I seemed to do on this floor. Just when I thought I'd seen all of it a new section would open up. Why have one Champagne Bar when you can have four - Champagne Jacquart, Moët & Chandon, Roederer and Veuve Clicquot. 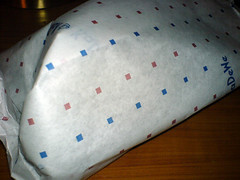 Cured meats weren't just divided into countries of orgin, the local german product was divided into regions as well. I've never seen so many hams, salamis and sausages in all my life. I never even thought so many varieties existed. 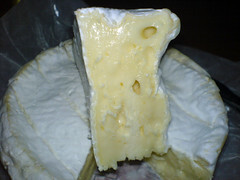 French cheese was given it's own section as was French pastries and bread - Lenôtre the in-house baker. Paul Bocuse was present in a dining area. 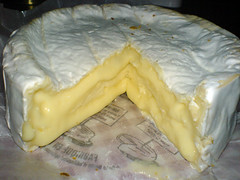 Then we had the vegetables, fruits, salads, tea, coffee, conserves, pasta, caviar and foie gras, hors d'oevres and antipasto, wines and spirits and who can leave out the meat and fish. 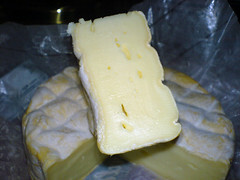 Needless to say I didn't leave empty handed gathering a couple of cheeses and a little treat from Lenôtre. 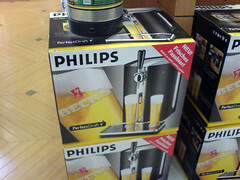 It's the Philips "Perfect Draft" just stick your keg into the machine and you have beer on tap, becks of course - it's a mandatory requirement for all homes to have at least one. 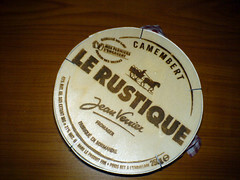 Le Rustique Camembert from Normandie - a little time out of the fridge and it oozes perfectly. 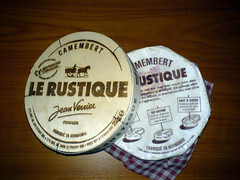 This is considered a commercial cheese and it's made from pasteurised milk. 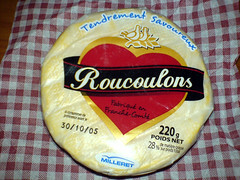 Roucoulons from Comté de Nice region of France. 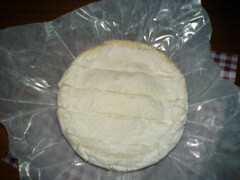 A brie style made from pasteurised and unpasterised milk. 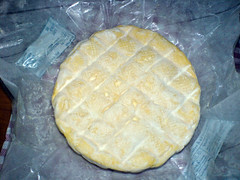 It has the characteristic of a washed rind with that lovely earthy aroma that fills your fridge. 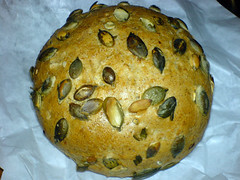 This was a most enjoyable sunflower seed roll, beautifully crisp with soft insides. 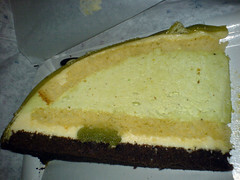 I'm going to have to finish it off tomorrow.